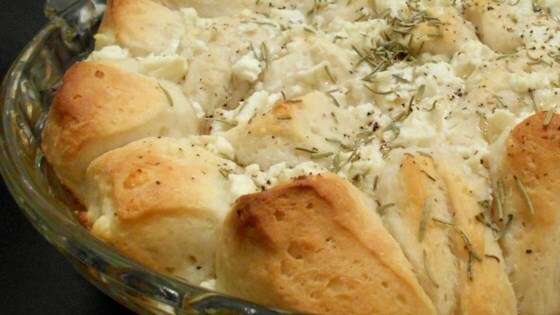 "Canned biscuits, butter and blue cheese. Voila, a nice appetizer. Rich and so good and easy!" Preheat oven to 400 degrees F (200 degrees C). Lightly grease a 9-inch pie plate with non-stick cooking spray. Slice each biscuit into quarters, arrange then in the prepared pie plate. Pour melted butter over the biscuits, then sprinkle the biscuits with blue cheese. These were ok. I made for a party and there were a lot left over. I love blue cheese but these just didn't hit the spot! This recipe was a hit at my most recent dinner party. Next time, I will reduce the butter by about half. According to my date, "this one is a keeper."